Iguazu Falls, also Cataratas do Iguaçu in Portuguese and Cataratas Del Iguazú in Spanish are waterfalls that straddle between the Brazilian State of Paraná and Province of Misiones in Argentina along the River Iguazu. Iguazu Falls, also Cataratas do Iguaçu in Portuguese and Cataratas Del Iguazú in Spanish are waterfalls that straddle between the Brazilian State of Paraná and Province of Misiones in Argentina along the River Iguazu. It divides the river into upper and lower Iguazu. Below are some interesting things you need to know about the waterfalls. 1. There is a legend to explain the falls: God wanted to marry Naipí, an Aborigine girl against her wish. She escaped on a canoe with her human lover, Tarobá. 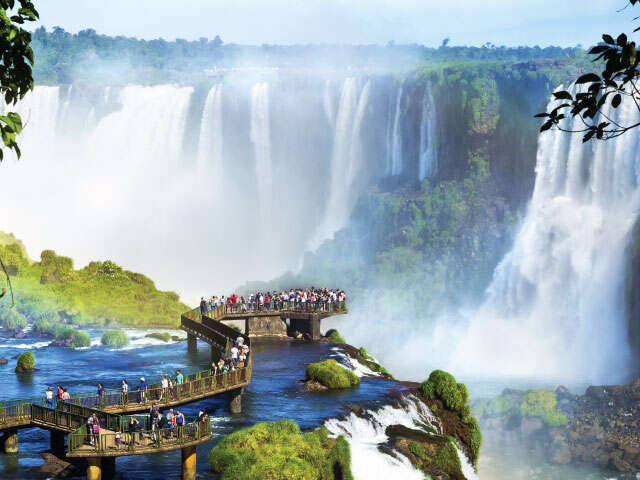 Upon realizing this, he got angry and separated the River Iguazu by creating deep falls so that the two will be condemned to an eternal fall. 2. With more than 275 falls, the Iguazu are the most majestic of water falls. The most scenic one is the curved cataract christened the 'devils throat' that has 14 falls that drop to a height of 350 feet. 3. The rainforest delta surrounding the falls boasts a whopping 2,000 species of plants. 4. Iguacu is wider than Lake Victoria on the Zambian/Zimbabwean border. However due to the outcrops that interrupts its water falls, it is considered smaller. 5. There is a scenic rainbow formed on the waterfalls caused by the refraction of light against the mist caused by thundering waters. 6. Iguazu's surrounding forest is home to the opossum, he only marsupial that is found outside Australia. 7. The rainy season of November through March sees a surge in the waterfalls water that can go to as high as 450,000 cubic feet per second. 8. There is a point in the water falls that an observer can stand and get enveloped by about 260 degrees of waterfalls. 9. First Lady Eleanor Roosevelt, upon seeing the Iguazu Waterfalls felt pity on the American Waterfalls called the Niagara. She said, "Poor Niagara". 10. The best time to see the waterfall is during spring and fall. The summers are extremely humid and hot and during the winters, the waters will have receded. Iguazu Waterfalls are second only to Victoria Waterfalls in size. However, in terms of beauty, none of the other waterfalls in the world can come close to compete. If you are a nature buff and have never visited Iguazu, then you have missed out.